To ask the Secretary of State for the Home Department what research her Department has (a) commissioned and (b) evaluated on the effect of reclassifying drugs on their production, supply and use. A huge political and media ballyhoo is made about drug classification, especially when a previously unclassified drug is classified (e.g. GHB, Ketamine and fresh magic mushrooms recently) or has its classification increased (Methamphetamine this year) or decreased (Cannabis in 2004). Obviously, looking beyond all the rhetoric and political posturing, it would be useful to know whether these changes have any meaningful impact on on key indicators of policy success/failure (as was highlighted in some detail last years Science and Technology Select Committee Inquiry into the Classification System). Unfortunately we don't know, and we have no systematic review or useful published information provided by the Home Office that might arguably constitute a meaningful 'evaluation' of these much-hyped policy shifts. So it seemed like a reasonable and simple question. The Home Department undertakes and evaluates several surveys in order to monitor levels of illegal drug production, supply and use. These are not predicated on the ABC classification system but where they are drug specific, any changes are closely monitored following a drug's reclassification. Relevant published research is also routinely considered. In reply we are told that the Department undertakes and evaluates 'several surveys.' No specific names of or links to surveys are given, and the comment is a general statement on normal practice, which does not state whether any surveys have actually been done on this issue. So all we are given is a vague statement that work is being done; but for some reason we are not to be told what it is. We are then told 'where they are drug specific, any changes are closely monitored following a drug's reclassification.' Again this is just a vague statement that monitoring is done, as a general rule. Nothing is said on whether monitoring is actually taking place, who is doing it, how, and when the results are due. The lack of information given here is a matter of grave concern in response to an MP's enquiry. Transparency is nonexistent here; Vernon Croaker is wasting Parliamentary time and resources on empty words. Both MP and the public that he and Croaker serve, are being treated with paternalistic condescension, as if we are children not yet mature enough to be allowed a clear answer to an adult question. Can we please have an informative answer to the question giving specifics on what research is being undertaken into the effects of changing drugs' classification? An honest answer would give the names of those in charge of the research, their sampling methods, and the date results will be available." 'Cannabis use down since legal change', the Guardian reports today on its front page. And its true, at least if you believe the British Crime Survey. The report also knocks holes in a number of other recently hyped skunk-cannabis panics perpetuated by various tabloids and the Independent on Sunday (with its road-back-from-Damascus re-conversion to the wisdom of mass criminlisation of young people as the sensible policy response). The Guardian report, in a welcome break from much of the reefer madness of the last year, highlights the fact that trends in reported cannabis use amongst 16-24 year olds (including frequent users), and 16 to 59 year olds, have declined steadily in recent years. Of course, the BCS is not without its methodological flaws; it is generally acknowledged to under-estimate total use because it is a household survey and consequently misses out on certain groups – students, and those with no fixed address - with generally higher levels of use. That said, it is at least consistent in its methodology so there is no reason to think the general trends it describes are not for real. There are, however, a couple of further observations that today's broadsheet coverage miss out on. Firstly, overall prevalence of use is not an especially useful measure of overall harm related to use. If patterns of more intense or risky use are increasing it is quite possible that falling use could be associated with increasing harm. Similarly rising prevalence could potentially be associated with decreasing harm in the opposite scenario – you just don't know without some more detailed research on using behaviours. Some research from the Joseph Rowntree Foundation, (also published this week) shows how heavy use can cause real problems, but also highlights the links between such patterns of problem use and social deprivation. Both of these observations point to a more important analysis: that classification of cannabis appears irrelevant to either overall levels of use, or levels of problematic use. As Transform has long argued patterns of use are determined predominantly by a complex interplay of social, economic and cultural variables, there is no evidence to suggest changing classification has a meaningful impact on deterrence, and enforcement and drug policy more generally can -at best- only have a marginal impact on levels of use. There may well be an increase in problematic cannabis use occurring, but it remains hard to quantify and whatever its true scale the appropriate response should be always be public health led rather than based on an criminalisation /enforcement approach already tried for three decades with demonstrably disastrous outcomes. If, as the research suggests, the key determinants of problematic drug use are related to social deprivation then any long term response must focus on addressing these underlying social causes. Classification seems to have become a symbolic talisman in the ongoing culture wars, dominating political discourse over the past five years in a fashion that grossly overstates its relevance in practical terms. Should cannabis be B or C has somehow, ridiculously, come to represent an ideological position, namely whether someone is 'pro' or 'anti' drugs. Support C and you are part of a sinister Soros-funded conspiracy to legalise drugs and make crack available in school tuck shops, support B and you are a tireless warrior in the crusade to create a drug free world. Meanwhile in the real world classification remains almost entirely irrelevant to young people, dealers, and indeed the police, who still have the flexibility to enforce the laws regards cannabis as they see fit. In more than twenty cannabis panic features in the IOS since March the BCS figures have never been mentioned. The number of 16- to 24-year-olds who smoked cannabis in 2006 has fallen by a quarter since 1998 – the last time the Government published its drug strategy. And among 11- to 15-year-olds cannabis use is also down: 10 per cent of pupils had smoked cannabis last year, down from 13 per cent in 2003, 2002 and 2001. So even though the figures aren't sourced (the first being from the BCS and the second from the DoH schools survey - both not without flaws), I retract the specific claim, with apologies to the Independent on Sunday. That said, I don't retract or apologise for Transform blog critiques of all the other skewed, misleading and sensationalist reporting of this issue since March, or the shortsighted editorial analysis and comment that has accompanied it. Foreign Policy magazine have subsequently produced a series of online videos in which Nadelmann is interviewed, alongside a prohibitionist counterpoint from David Murray, chief scientist at the U.S. Office of National Drug Control Policy. As it is public domain on You Tube, the videos are posted below, in four parts of around 5 minutes each . The FPTV link is here . Part I: Who's Winning the Drug War? "We are making major progress," argues Murray, adding, "We and the rest of the civilized world has made this decision: This must be fought." But the drug war is "a long, slow, devastating failure" that is as bad as Vietnam and Iraq, Nadelmann counters. How much does the war on drugs cost each year? Nadelmann, who estimates that the tab for the global war on drugs runs as high as $100 billion annually, says the U.S. Office of National Drug Control Policy is "playing with numbers." Part III: Can Harm Reduction Work? These controversial programs could amount to "sustaining people in their continued drug use," Murray contends. Nadelmann likens this argument to saying, "If somebody shoots drugs, better off to let them die." "The problem isn't the law, Murray says. "The problem is the drug." Nadelmann slams Murray's office as "analogous to the Ministry of Information in the old Stalinist Soviet Union in terms of accuracy and truthfulness." There was an interesting piece in yesterdays Observer newspaper, in which Transform loomed large. 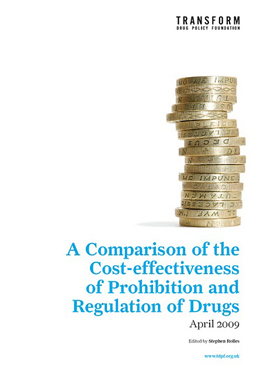 The item drew together three separate but related stories; The publication of the report by the Chief Constable of North Wales calling for the legalisation and regulation of drugs; the ending of the drug strategy consultation period and Transform's criticisms of the consultation and review process; and Transform's new publication 'After the War on Drugs, Tools for the Debate' which has its official launch at a Parliamentary reception later this week. It is a welcome plug for the report and will add pressure on the Government to undertake a more meaningful review of the evidence of the last ten years than the rather preposterous piece of window dressing that we were given in the consultation document. Also look out at the end for a new entry in the all-time top ten stupid Home Office comments on drug policy, wherein we learn that legalisation of drugs can't proceed because it would be against the law. Doh! The government's consultation on a new 10-year drugs strategy is a 'sham', according to one of Britain's leading think-tanks on narcotics, which warns that the current policy is fuelling a crime epidemic. The report claims that drug prohibition has allowed organised crime to control the market and criminalised millions of users, putting a huge strain on the justice system. The Home Office estimates that half of all property crime is linked to fundraising to buy illegal drugs. The police claim that drug markets are the main driver of the UK's burgeoning gun culture. Official figures released last week showed that drug offences recorded by police had risen 14 per cent in April to June of this year, compared with the same period in 2006. Politicians claim tough anti-drugs laws send clear signals to society. But Transform points to a Home Office survey, commissioned in 2000, which showed the social and economic costs of heroin and cocaine use were between £10.1 and £17.4 billion - the bulk of which were costs to the victims of drug-related crime. Last week, North Wales Police chief constable Richard Brunstrom said he would 'campaign hard' for drugs such as heroin to be legalised. Previously he has said that drugs laws are out of date and that the Misuse of Drugs Act 1971 should be replaced by a new 'Substance Misuse Act'. The think-tank has taken the unusual step of writing to the Better Regulation Executive, set up to ensure government runs smoothly, to complain that the Prime Minister, Gordon Brown, is already making policy before the consultation process had finished. The Prime Minister signalled earlier this year that the government would reclassify cannabis. He also recently insisted the government would never decriminalise drugs, something Transform argues makes a mockery of the consultation process. The DHA today published its submission to the Government's deeply flawed consultation process. The submission can be read in full here (pdf format) (html format). Below is the accompanying covering letter. Please find enclosed/attached the submission from the Drugs and Health Alliance (DHA) to the Drug Strategy Consultation Paper 2007, Drugs: Our Community, Your Say. The Drugs and Health Alliance (DHA) is a group of organisations and individuals who support an evidence-based, public health-led approach to dealing with illegal drugs. The consensus statement, to which all the member organisations have signed up to, is available on the DHA website: http://www.drugshealthalliance.net/ (please refer to this website for further information and a regularly updated list of member organisations). The DHA was established in 2006/07 in part to encourage constructive input into the drug strategy review process and related consultation. As stated in the DHA consensus statement, it is our view that problems with UK drug policy ‘are perpetuated by the Government's failure to conduct an evidence based review of the progress of the UK drug strategy and its failure to consult with informed public opinion’. The DHA represents one such body of opinion. We sincerely believed that the review and consultation process would be a genuine opportunity for open dialogue with key stakeholders, that the successes and failures of the last 10 years would be objectively reviewed, and that actual change in both the focus of policy and decision making infrastructure was a real possibility. This belief was the spur for the formation of the DHA. We have been disappointed to see that the process so far has not met any of these expectations and we have outlined our specific concerns in introduction to our submission. We make this submission despite these concerns in the hope that the relevant policy makers will give due consideration to its contents. We also hope our concerns about the flawed review and consultation process can be responded to accordingly, by delaying the new strategy publication and instigating a process in line with what everyone in the drugs field had hoped for and expected (regardless of their policy positions). We aim to continue with the process of engagement and would welcome the opportunity for DHA representatives to meet with relevant officials and ministers to present our ideas for achieving a more just and effective 10 year strategy that puts public health and harm reduction at the heart of policy development and implementation. Following on from Chief Inspector Brunstrom's report last week the BBC's long running series the Moral Maze tackeled the moral issues around illicit drug use and specifically the laws that criminalise it. The Chief Constable of North Wales, Richard Brunstrom is notable for his enthusiastic prosecution of speeding motorists. This week he's turned his attention to the problem of drugs. You might expect a police officer with his credentials to be calling for tougher action; after all it's estimated in Britain that drugs and the crime related to their use, cost £16 billion pounds a year. But no. Mr Brunstrom wants drugs to be legalised. The war on drugs has been lost, he says and it's time to come up with a more radical solution. When you look at the figures he might have a point. Despite all the money spent on prohibition, the worldwide narcotics business is worth $177 billion dollars a year. Only the oil industry beats it. But, illegal narcotics kill hundreds of people in Britain every year and inflict a life of misery on many thousands more. In the face of all the human suffering that drug-taking causes, is it immoral to just admit defeat? Melanie Phillips, Ian Hargreaves, Claire Fox and Professor Jules Pretty cross-examine the experts. Developing and implementing more effective policy responses to problematic drug use doesn't seem like defeat to me, more like progress. It only appears so when it is couched in the context of misplaced 'drug war' rhetoric, but there you go. The program is a good one as far as media drug debates go because of the high caliber of the participants and the fact that enough time is given to explore some of the issues in more depth than much sound-bite media allows. In response to Brunstrom's arguments Mel P does her familiar righteous indignation, bolstered with her own curious take on facts. She claims, wrongly, that countries with harsher enforcement have lower drug problems (there is no clear correlation) , and also somehing about how three quarters of children mudered in the US being 'because of cocaine'. Brunstrom can only respond to Phillips unique personal understanding of factual reality by noting she is wrong and moving on. Phillips gets so worked up by Jamie Whyte (arguing a libertarian position) that Micheal Burke has to intervene. 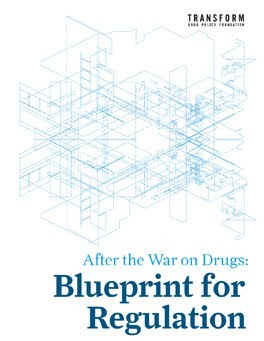 Whyte dares to suggest that some drug use may actually be beneficial (on a cost benefit analysis to the user) thereby challenging one of the central pillars of the moral objection to legalisation; that all drug use is intrinsically unacceptable. Whyte also suggests that there is a moral equivalence between consensual adult risk taking behaviours that involve illegal drugs and consensual risk taking adult behaviours that involve dangerous sports, like mountaineering, or indeed legal drugs, like alcohol. It's a controversial position to put forward, and whilst it riles Phillips and others, it's interesting that none of the panelists make a worthy counter-argument. Old Transform sparring partner, and occasional blog poster David Raynes also makes an appearance but doesn't contribute a great deal as his position is essentially the same as that of Melanie Phillips. He clearly had one point he wanted to make about the writings John Stewart Mill and fails to engage usefully when challenged beyond that. A bereaved mother also appears but whilst relating her own personal tragedy (her son died of an overdose) she is unable to grasp the point made to her by Claire Fox (who supports the Brunstrom view) that moral positions and cultural norms that are firmly opposed to drug use could be developed outside of a prohibitionist framework. All interesting stuff and a welcome contribution to the debate. If you want to weigh in with your own views there is a BBC online discussion forum here. Currently the views expressed are almost all pro-reform. Come on prohibitionists - where are you? Its hard to have a debate without someone to argue against. A new short film on youtube produced by US based Students for Sensible Drug Policy highlights one of the more distressing outcomes of the when the US war on drugs collides with education policy and a crisis in military recruitment. The Military has changed its rules to make it easier for drug offenders to enlist... whilst the aid elimination penalty of the Higher Education Act denies federal financial aid to students with drug convictions. That's right, the federal government thinks drug users don't belong in college, but has no problem sending them to fight in foreign wars. North Wales Police Authority have endorsed a report from the North Wales Chief Constable that calls for the repeal of drugs prohibition and its replacement with an effective system of legal regulation and control for all drugs. 2.1 That the Authority submits a response to the current Home Office consultation on drugs strategy. 2.2 That the Authority submits a response to the forthcoming Welsh Assembly Government consultation on the all Wales substance misuse strategy. 2.3 That the Authority urges the repeal of the Misuse of Drugs Act 1971 and its replacement with a Misuse of Substances Act, based upon a new ‘hierarchy of harm’ that includes alcohol and nicotine. 2.4 That the Authority seeks affiliation to Transform Drug Policy Foundation which campaigns for the repeal for prohibition and its replacement with a legal system of regulation and control. “It is hugely significant that the call for a legal regulation and control of drugs has now been publicly supported by the North Wales police authority, and they are to be congratulated in taking a bold stand in this urgent and vital debate. There are many high profile individuals who support this position but this sort of institutional support really puts the debate centre stage. We hope to see other police authorities following their lead and we look forward to the Police Authority affiliating to Transform in the near future. The Chief Constable of North Wales Police Richard Brunstorm, recommends in a report published today, that his Police Authority officially support his call for the legalisation and regulation of drugs, as part of their submission to the drug strategy consultation being conducted by the Government. He also recommends that they affiliate to Transform Drug Policy Foundation. The Authority meets on Monday 15 October to discuss the recommendations. "We are absolutely delighted at Mr Brunstrom’s paper. The Chief Constable has displayed great leadership and imagination in very publicly calling for a drug policy that replaces the evident failings of prohibition with a legal system of regulation and control for potentially dangerous drugs”. The Council of Europe, representing 47 member states and a population of over 800 million people, has adopted a convention on promoting public health policy in drug control. This move marks a very positive evolution in international drug policy thinking; away from the heavy handed enforcement focus of old school prohibition, towards an more evidence based public health focus for future pan-European policy. The full text is reproduced below. Whilst the convention's power is essentially rhetorical, it is reassuring that the broad thrust of the convention has been supported by UK, Sweden and other traditionally more dogmatic / enforcent oreiented European states (although some compromise is evident - in terms of supporting enforcement e.g. point 11.8 - there's also a clear acknowledgement in the preamble that supply side efforts have been costly and ineffective and that a public health and harm reduction paradigm should be the focus of future policy). The convention arrives at a timely moment in the evolution of both domestic and international drug policy with the UK and UN's ten year strategies being held up to scrutiny and a window of opportunity opening for new thinking to help shape the next ten year strategies. The convention is also a welcome endorsement for the Drugs and Health Alliance with which it shares many core principles. 1. Drug addiction is a complex biological, psychological and societal problem. Scientific research and practical experience have made it possible to broaden our knowledge of it. Increasingly, this improved knowledge allows the implementation of a drugs policy focused on preserving public health, for individual addicts and for society. Although many scientific questions concerning dependency remain unanswered, the aspects linked to public health, the effectiveness of prevention and of medical treatments and improved protection of society against the resulting health risks are now better known. 2. Since the late 1960s, considerations of public health have played an increasing role in pragmatic, evidenced-based drug policy-making in many member states of the Council of Europe. The right to health provides the cornerstone principle on which such considerations are based. This right is recognised in the Council of Europe acquis (Articles 11 and 13 of the Revised European Social Charter) as well as in numerous other international and regional human rights treaties. It grants every individual the right to the enjoyment of the highest attainable standard of health, defined by the World Health Organization as a state of complete physical, mental and social wellbeing. 3. A number of key public health responses to “problem drug use” have emerged in past decades, including substitution treatment, needle exchange programmes and psychosocial treatment. These measures have had a marked effect on the successful long-term rehabilitation of drug users and their reintegration into society. The resultant benefits have been felt by society as a whole, through reductions in the incidence of criminal behaviour, reduced costs for health and criminal justice systems, reduced risks of transmission of HIV and other blood-borne viruses, increased productivity and ultimately reduced drug use levels. 4. However, these responses have so far been employed only on a fragmentary basis across Europe. This is despite the fact that their utility and cost-effectiveness is now widely documented. According to estimates cited by the European Monitoring Centre for Drugs and Drug Addiction (EMCDDA), for example, every dollar invested in opioid dependence treatment programmes may yield a return of between $4 and $7 in reduced drug-related crime, criminal justice costs and theft alone. When savings related to health care are included, total savings can exceed costs by a ratio of 12:1. 5. Moreover, recent world trends have provided additional proof of the abject failure of efforts to reduce the production and supply of drugs. The current illegal drugs market in Afghanistan, the world’s largest producer of heroin, provides ample evidence of the ineffectiveness to address the drugs problem in a comprehensive manner. Despite six years of military action to restrict the poppy crops in the country, the United Nations have confirmed that poppy crop production in Afghanistan has increased by 60% for the year 2006-2007 compared to the previous year. 6. Steps being taken in the European Union as part of the EU Drugs Strategy 2005-12 aim to achieve a high level of health protection by complementing EU member states’ action in preventing and reducing drug use and dependence and drug-related harm to health and society. In particular, the strategy places a high priority on improving access to a range of public health orientated responses that can reduce the morbidity and mortality associated with drug dependence. However, it is clear that special efforts need to be taken in relation to Eastern Europe and Central Asia, where political and infrastructural obstacles have hindered the implementation of such responses. The escalating HIV/AIDS pandemic in these regions provides an added urgency to this imperative: 80% of HIV cases with a known route of transmission in Eastern Europe and Central Asia are due to injecting drug use. 7. The geographic sphere of influence of the Council of Europe makes it the ideal forum to undertake such efforts and send an unequivocal signal giving a framework to its member states to develop public health-orientated responses to problem drug use. In pursuit of this end, which has been emphasised by the Pompidou Group and the International Federation of Red Cross and Red Crescent Societies, the Parliamentary Assembly calls upon member states to work together to design a convention promoting public health policy in drug control. This convention should complement existing legal instruments in the areas of drug control, human rights and public health. It should consolidate scientific and medical knowledge in a framework document which may form the basis for the design of national drug strategies. 8.3. help identify good practices for the operation of the right to health as it applies to problem drug use, at the community, national and international levels. 9.4. monitoring and evaluation, aimed at identifying best practices. 10. Insofar as many of the negative consequences of drug use are felt at local levels, the convention should also seek to reaffirm the principle of subsidiarity, by encouraging consideration of the ways that more local government agencies may act effectively. In this way, it is intended that health-driven drug policy responses be guided by scientific evidence as well as local conditions. 11.12. provide appropriate financial support. 1 Assembly debate on 3 October 2007 (33rd Sitting) (see Doc. 11344, report of the Social, Health and Family Affairs Committee, rapporteur: Mr Flynn). Text adopted by the Assembly on 3 October 2007 (33rd Sitting). Lawmakers are considering lower penalties for small-scale recreational drug growers under a Criminal Code change that decriminalizes recreational drug use. If the new Criminal Code passes, marijuana growers would face six months in jail if they produce more than an amount deemed to be for their own use. Anyone who makes drugs or possesses them in certain quantities can go to jail for one to five years if caught under the current law.The idea behind the amendment is to separate recreational drug users from “the black market,” says Justice Ministry spokeswoman Zuzana Kuncová. possession or cultivation of “light” drugs such as marijuana for individual use, but remain strict for possession or sale of hard drugs, such as cocaine, methamphetamines and heroin. Possession, manufacture, transport or sale of both light and hard drugs would continue to be regarded as a criminal activity, with penalties of up to 15 years in jail if leading to injury or death. This is not the first time lawmakers have addressed the drug penalty issue. that penned the original amendment. “The professional public saw this as a step backward from the trend in the European Union, but the politicians saw it otherwise,” Radimecký said. But far from lowering the amount of marijuana found on the streets, the tougher approach seemed to make things worse, according to a government study on the effects of the new policy conducted one year later. “Small-scale cultivators with so-called wild plots on the edges of fields or forests, whose plants had a far lower THC content, turned to organized dealers, whose products were much stronger,” Radimecký says. “The result was a merger of the light and heavy drug markets.” Based on the study, lawmakers decided to separate drugs into “light” and “hard” categories, leading to proposed amendments. In trying to lighten penalties for individual use of marijuana, the Czech Republic is joining a broader trend toward decriminalization across Western countries, including the United States. “Thirty years ago, it was common to find people serving 10- to 25-year sentences for just the possession of a personal amount of marijuana,” said Keith Stroup, Legal Counsel of NORML (National Organization for the Reform of Marijuana Laws), a U.S. marijuana advocacy group. In stark contrast to the populist tough-on-drugs bidding war currently consuming UK policy thinking in the run up to the (probably) imminent election, over in Israel, a traditionally far more conservative country than here, the general inspector of the Israeli Police, Dudi Cohen, has announced that police will no longer arrest first-time drug users in an effort to refocus drug law enforcement. The move comes as Israeli police reported they made more than 16,000 drug possession arrests and more than 8,000 drug sales arrests last year. The move appears to have a similar motivation to some police calls for the de-prioritisation or de-penalisation of possession offences in the UK: they are a drain on resources that produce no tangible benefits. Israeli drug use levels are generally in line with those of Europe and North America. According to the UN Office on Drug Control's 2007 World Drug Report, 8.5% of Israelis smoke marijuana in a given year, placing them just below the more pot-friendly European nations (Cyprus, 14.1%; Italy and Spain, 11.2%; Switzerland 9.6%), as well as the US (12.6%) and Canada (16.8%). But for cocaine, opiates, amphetamines, and ecstasy, Israeli usage levels hover squarely in the Western middle, with prevalence rates around 1%. The shift in enforcement will begin with a pilot program for juvenile offenders, police said. The announcement came days after a widely-viewed documentary critical of the futility of the drug war appeared on Israeli television. Sounding very similar to much UK police rhetoric Cohen said: "We are not talking about the legalisation of drugs," ... "But we will focus on the dealers and not the consumers." "The General Inspector prefers to dry up the swamp instead of killing the mosquitoes one at a time," elaborated a senior officer in Intelligence and Investigations, the department which Cohen leads. "The system's new attitude toward users won't affect the popular drug use trends. Traditionally, when we stopped a student we caught for a first-time offense, he'd be delayed, brought to the station in a police car and would wait to be dealt with until a police officer was available to process his case; he'd endure a long interrogation and finally we'd look for a responsible party to come bail him out. The result was almost an entire day of police work dedicated to a file that would almost never lead to an indictment." That amounted to a "useless investment" of police time, the officer said. Prosecuting all those drug cases resulted in a flood of cases for prosecutors that clogged the courts and took years to resolve, he added. Besides, he said, first-time drug offenders could be scared enough by police contact alone to change their ways. For those who don't, there is always the criminal justice system. "For most of those caught for the first-time, any contact with the police creates fear, explained the officer. When it comes to someone who's not a first-time offender, but that this is his way of life, we will prosecute him to the full extent of the law because he might drive under the influence or steal to pay for his drug use." While the Green Leaf Party, which seeks cannabis legalisation, welcomed the development, it was doubtful about the impact of the new policy and vowed to continue to work for an end to prohibition in the Jewish state. "It is not clear to us that this will benefit marijuana users in any way, as once you've been stopped once, the second time they are free to arrest you," said Michelle Levine, a Green Leaf spokesperson. "They claim they are doing this to get the focus back on the distributors, though they've never focused on the distributors before. Furthermore, the police statement acknowledges that they will still interrogate first-time offenders when stopping them and recording their details for future interactions. That means they may ask them who their distributors are -- pressuring them to give names. The only difference at all is the first time a smoker is caught by the police with a small quantity, he will not actually be taken down to the station or charged, as is now the case," she said. Green Leaf will continue to work for legalisation, said Levine. "The Green Leaf Party is very busy with many projects right now, as we're organizing the 2nd Joint Arab Israeli Conference for Marijuana Policy and Peace, but we will not let up on the police for wasting taxpayer money on the drug war and we will not let up on our elected officials while nonviolent patriotic citizens rot in jail for marijuana offenses." The Israeli police, for their part, will continue to fight drug trafficking. A new unit for the Negev region will work to seal the Jordanian border, which police describe as the major drug terminal for heroin and hashish being trafficked from Afghanistan. Another unit patrolling the Lebanese border will be reformed to concentrate on blocking Lebanese hash, as well as Afghan heroin and South American cocaine.